Western blot analysis of extracts from cells expressing different activated tyrosine kinase proteins, using Phospho-HER2/ErbB2 (Tyr1221/1222) (6B12) Rabbit mAb (upper) or Phospho-Tyrosine mAb (P-Tyr-100) #9411 (lower). 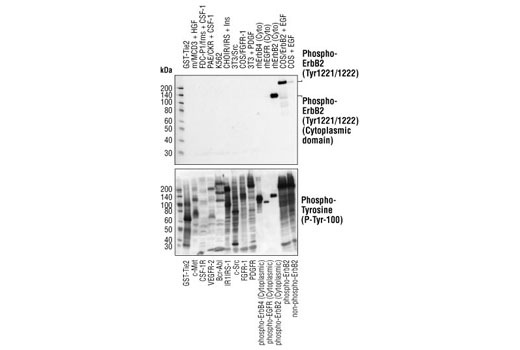 Phospho-HER2/ErbB2 (Tyr1221/1222) (6B12) Rabbit mAb specifically detects phosphorylated HER2/ErbB2 but not other phosphorylated tyrosine kinases. 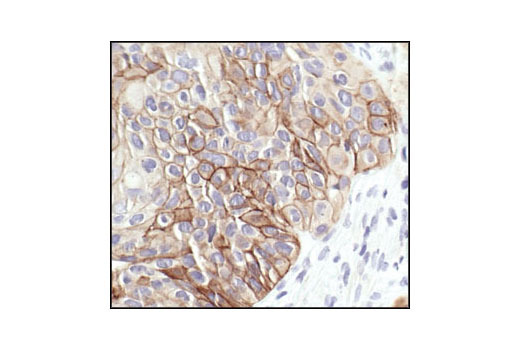 Immunohistochemical analysis of paraffin-embedded human breast carcinoma, showing membrane localization, using Phospho-HER2/ErbB2 (Tyr1221/1222) (6B12) Rabbit mAb. 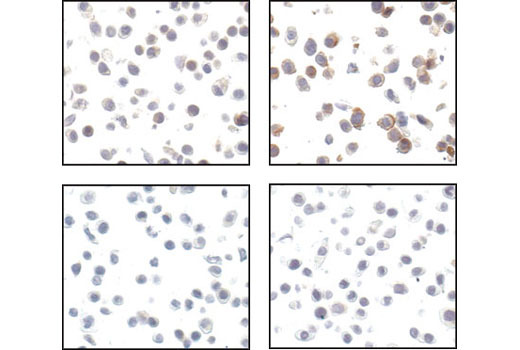 Immunohistochemical analysis of paraffin-embedded SkBr3 cell pellets untreated (left) EGF-treated (right) either untreated (top) or lambda-phosphatase-treated (bottom), using Phospho-HER2/ErbB2 (Tyr1221/1222) (6B12) Rabbit mAb. 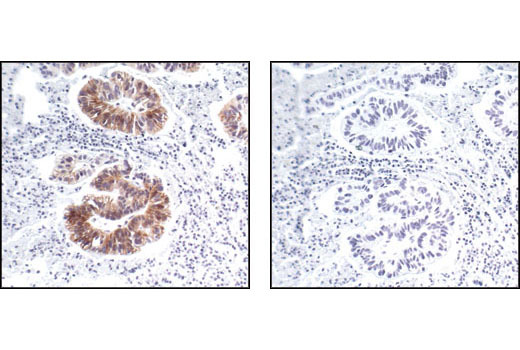 Immunohistochemical analysis of paraffin-embedded human renal adenocarcinoma, using Phospho-HER2/ErbB2 (Tyr1221/1222) (6B12) Rabbit mAb in the presence of control peptide (left) or Phospho-HER2/ErbB2 (Tyr1221/1222) Blocking Peptide #1254 (right). 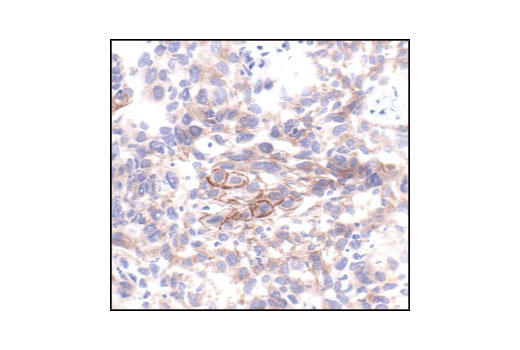 Immunohistochemical analysis of paraffin-embedded human NCI-H358 xenograft, using Phospho-HER2/ErbB2 (Tyr1221/1222) (6B12) Rabbit mAb. 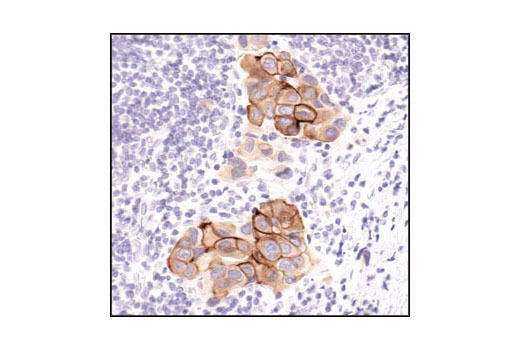 Immunohistochemical analysis of frozen HCC827 xenograft, using Phospho-Her2/ErbB2 (Tyr1221/1222)(6B12) Rabbit mAb. To prepare 1 L 1X PBS: add 50 ml 20X PBS to 950 ml dH2O, mix. Fix sections for 15 min at room temperature in 3% formaldehyde, followed by 5 min in methanol at -20°C (do not rinse in between). Proceed with staining immediately (Section D). Wash sections in wash buffer twice for 5 min. Add 100-400 µl biotinylated secondary antibody, diluted in wash buffer per manufacturer's recommendation, to each section. Incubate 30 min at room temperature. Phospho-HER2/ErbB2 (Tyr1221/1222) (6B12) Rabbit mAb detects endogenous levels of ErbB2 only when phosphorylated at tyrosines 1221/1222. The antibody does not detect other activated Erb family members or other tyrosine-phosphorylated proteins. Monoclonal antibody is produced by immunizing animals with a synthetic phosphopeptide corresponding to residues surrounding tyrosines 1221/1222 of human ErbB2 protein.